There are different methods to defrag hard drive, while Command Prompt is one of solution for disk defragment. When a hard drive contains too many fragments, it could have influence on the performance of the hard disk and slow down your computer. Defragmenting is a process to analyze the disk partition and defragment fragments in order to recover some disk space and improve the performance of your disk. Since data is written randomly to different clusters on a hard disk, there is no way to avoid hard disk fragments. Therefore, it is necessary to regularly defrag hard disk in order to improve performance. Before disk defragment, you need to do something for preparation. 1. Make sure that the disk partition has 15% free space at least in order to complete a defragment of a disk partition. If the available space on the partition you want to defrag is less than 15%, it can only defrag only a part of fragments. You can delete some unnecessary files, move files to another partition or free up disk space to get more free space on the partition. 2. It is necessary to analyze the disk drive to see if it needs to be defragmented. If system reports that there is no need to defragment the drive, you had better not perform disk defragment. Step2. Type defrag.exe plus the appropriate parameters (e.g. defrag.exe c: /a) to analyze or defrag the partition you need to defragment. You can type defrage.exe to show list of command line parameters, and then you can type a proper one based on your needs. Use defrage.exe to perform a partial defragmentation which attempt consolidates only the fragments that are smaller than 64MB. The c: in the list above refers to the C drive, you can replace c: with any drive letter else on your computer. If you receive this message, it means that there is no fragment on the partition. So you do not need to defragment this drive. Step1. 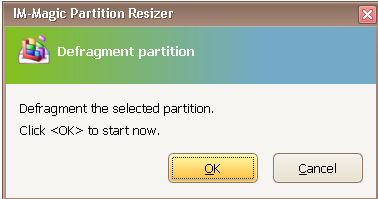 Right click the partition you want to defrag and select "Defragment" option.